Ahead of Pakistan's Independence Day, an Indian a capella band Voxchord teamed up with Voice of Ram (VOR) and sang the Pakistani national anthem as a 'gift'. Now, Pakistani students came together to sing Indian national anthem, Jana Gana Mana, as a 'return gift'. One the occasion of 70 years of Indian and Pakistani independence, we came across an Indian a capella band singing the Pakistani national anthem as “gift” to extend the hand of friendship. Soon, after it went viral, with a mostly positive response, we came across another beautiful jugal-bandi of the two national anthems — Jana Gana Mana and Pak Sarzamin. Many criticising the band for singing the Pakistani national anthem, argued that this beautiful gesture can never be reciprocated. However, putting all criticism to an end, a group of students from the neighbouring country sang Indian National anthem, and it’s heartwarming. The Voice of Ram (VOR), the social media group that started the musical initiative shared the video of Pakistani students singing Jana Gana Mana and it is now going viral. 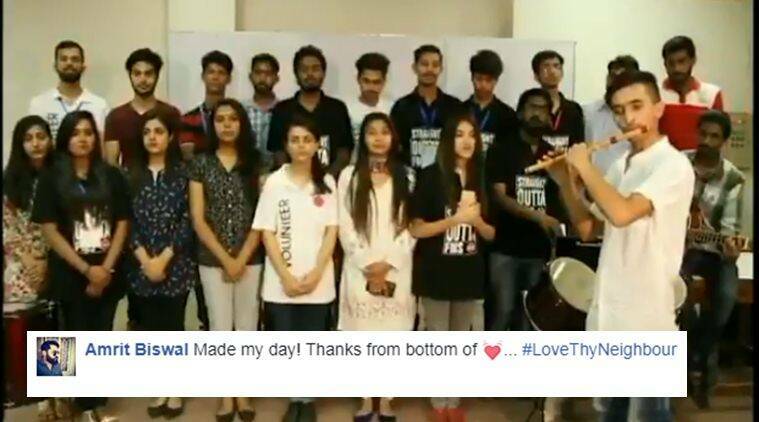 Students of Forman Christian University in Lahore came together to sing the song as a “return gift”.